Firstly, a confession: I have not read “The Hunger Games” books. This is actually something of an advantage, going into a movie adaptation without knowledge of the original material, because I can’t be disappointed by bad versions of favorite scenes or saved from confusion by having read the book. Unfortunately, it means I can’t really tell you how the film compares to the book. What I can tell you is that it’s a solid and exciting movie. Our setting is the future, apparently after an apocalypse. As punishment for a rebellion decades ago, each of twelve districts are required to give up one boy and one girl aged 12 – 18 to fight to the death in the annual Hunger Games. The Capitol, where the games are organized, is full of high fashion and high tech, but the district our heroine, Katniss (Jennifer Lawrence), comes from is all filthy coal mines and half-starved people. When her sister’s name is drawn to be sent to the Games, Katniss volunteers to take her place. She and Peeta (Josh Hutcherson), the young man chosen from her district, are sent off to be groomed and trained. 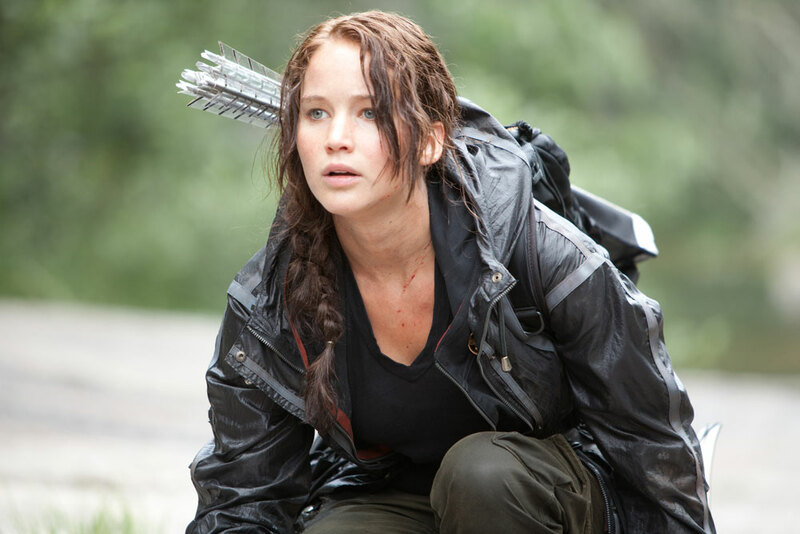 Lawrence gives us a Katniss who is mature beyond her years but experienced only in the hardscrabble life she comes from. She practically raised her younger sister after her father died and her mother fell into a depression, finding the family enough to eat by sneaking out of the district grounds and hunting with a bow in a nearby forest. It’s refreshing to see a female teenager who is more interested in survival than in finding a boyfriend, who is skilled in survival and determined to make it back to her family by any means necessary. It’s easy to read “The Hunger Games” as heavy-handed: just on a fairly surface level it’s an indictment of reality TV, the cutthroat nature of adolescence and high school, and the disparity between rich and poor. What saves it from being a crushing two-by-four of symbolism to the side of the head is a combination of solid casting and well-paced suspense. It’s easier to ignore the glaringly obvious social commentary when you’re caught up in the excitement of how on earth Katniss is going to survive a situation that’s essentially “Lord of the Flies” on steroids. The one time the adaptation process made the film a little clunky is a subplot of unrest in the districts, which seemed unnecessary for a self-contained film already long at over two hours. Knowing, however, that the unrest is a major part of the story in the other books, it makes sense to include it here to set up films of those sequels. The only thing the film does very, very badly is the cinematography during action sequences. There’s way too much hand-held jigglycam, and it’s very difficult to enjoy the stunts and choreography when you’re unable to see much besides blurs. I survived “Cloverfield,” but there were scenes in “The Hunger Games” that made me seasick. That aside, if you’re looking for a grim action flick with a strong female protagonist, do not miss this. “The Hunger Games” is not for those with soft hearts — don’t be fooled by the PG-13 rating into thinking there aren’t gruesome, visceral deaths of youngsters here — but it’s a very satisfying tale.